Lightly loaded and partner-less, I left the Chautauqua trailhead a bit before 8am and followed the Mesa Trail south until I stopped following the Mesa Trail. The trail kept going, but I needed to head uphill and west to reach the base of The Regency, and the El Camino Royale route. The third class rating is a bit of a joke, that or the way I went wasn’t the road of royalty, but the path of jesters. The route was fun regardless of whether or not I was on it. A short downclimb and scramble through some boulders took me to the base of the East Face route of the Royal Arch. This was pretty straight forward Class 4. For better or worse, no one below seemed to see me on my giant pedestal. From the arch I headed further south, but stayed too high to efficiently reach the base of Anomaly, and bushwacked down the north side of the formation. This was the least memorable route of the day, 4th class, rather licheny and uh, I don’t remember any other details. Oh, there was a dead tree at the base. Did I mention the lichen? 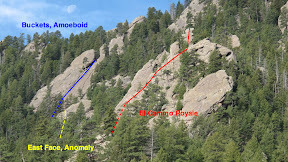 The Buckets route (Class 4) on Ameoboid was a definite step up in quality. The whole east fast of Ameoboid was stripped with a line of pockets and was just a blast to climb. Unfortunately, the route doesn’t top out on a real summit. I walked the short canyon between the north and south summits, then looped south around the formation and back to Royal Arch to jog most of the trails back to Chautauqua. I took very few photos, instead I carried a small HD camera (GoPro) with a mini tripod and set it up where I could on the routes. I ended up repeating many short sections of the scrambles to setup the camera, back down, then climb back up and retrieve the camera. The results of those efforts are below. Thanks! Sorry I didn’t see any interesting critters on this outing.